Please note that the links that are provided on this site are for information purposes only and ARE NOT an endorsement of the information provided by any other web site. We reserve the right NOT to link to any web site for any reason. Not all web sites are what they seem, and you may find yourself on a web site being run unscrupulously, and exploiting the natural nostalgia we have for our lost Rhodesia. There are a lot of these "Rhodesian" commercial web sites, and a few are not sound. Some lend themselves an aura of respectability by linking their web sites together. The Flame Lily Foundation and the Rhodesians World Wide magazine, both long standing Rhodesian institutions, have recently been the target of unpleasantness. We have taken the decision to not provide links to web sites about which we have concerns, or that have aims that conflict with ours, or that object to us. When you go through any of the links below that website will open in a new window in your browser. When you have finished looking close it and you will return to this page. The Rhodesian Soldier - Website of Gerry van Tonder, for professional research services, copy editing, proofreading - specializing in the service history of Rhodesians who served in the two World Wars. Commonwealth War Graves Commission - Commemorating the 1,700,000 men and women of the Commonwealth forces who died in the two world wars. South African War Graves Project - This searchable database is expanding daily. It contains records of over 29,000 Rhodesian and South African graves. There are 25,000 photographed graves and/or photos of headstones. It is a vitally important project for South Africans and Rhodesians. Piracy of Rhodesian based material is a big problem. Please support the businesses who are linked below. They are family based businesses and Associations who work hard and make sacrifices in order to provide quality products to the public. The true Rhodesian spirit was to support your mates. Do the right thing and be true to yourself and the Rhodesian Spirit. Signals Badges - Commonwealth (and ex-Commonwealth) Corps of Signals Badges ranging from the early 20th Century to the present date. Classic Flyers Museum - The Trust strives to gather, protect and preserve aircraft and aviation memorabilia from bygone times – especially material with a Bay of Plenty or New Zealand connection. The Rhodesian Services Association has a large display area in this museum. ORAFs - Old Rhodesian Air Force Sods welcomes 'Brown Jobs' as well. Email orafs@isdial.net to get on the newsletter mailing list. 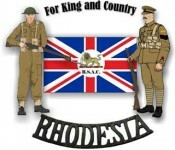 Rhodesian Army Association - based in the UK and producers of the Lion & Tusk magazine. Vic Walker, Chairman, vic.walker@sky.com and Will Ransom, Secretary,raasecretaryuk@gmail.com for details of membership and web content (www.rhodesianforces.org ). This list below consists of Rhodesian related businesses who have registered with us. Please also refer to Our Supporters page elsewhere on this website on this link for a complete list of our valued supporters. Active Nutrition - Diana Bomford can deliver nutrition plans, menus and advice to suit a range of people for the purpose of weight loss, supporting exercise and sports performance through nutrition and personal training programs; provide nutrition advice to alleviate certain health issues; training people in how to lead healthy, active and long healthy lives.